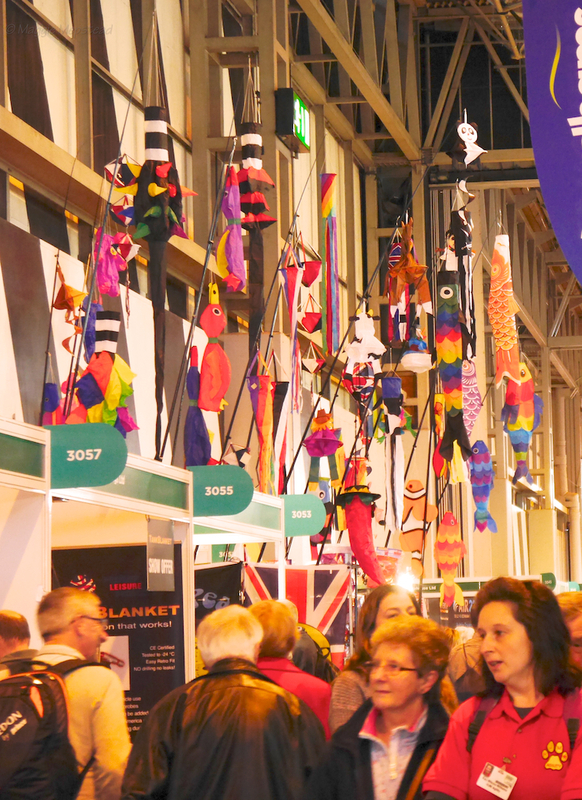 My plastic and I visited the well timed camping and caravanning exhibition at the NEC, Brum. I had a list and was determined for bargains. Saw plenty, but little I wanted or needed, so the plastic failed to melt! I did join a couple of good schemes for discounted (low season) campsites. I shall probably use a campsite every week or so to do laundry etc. Loved these bright colourful kites. 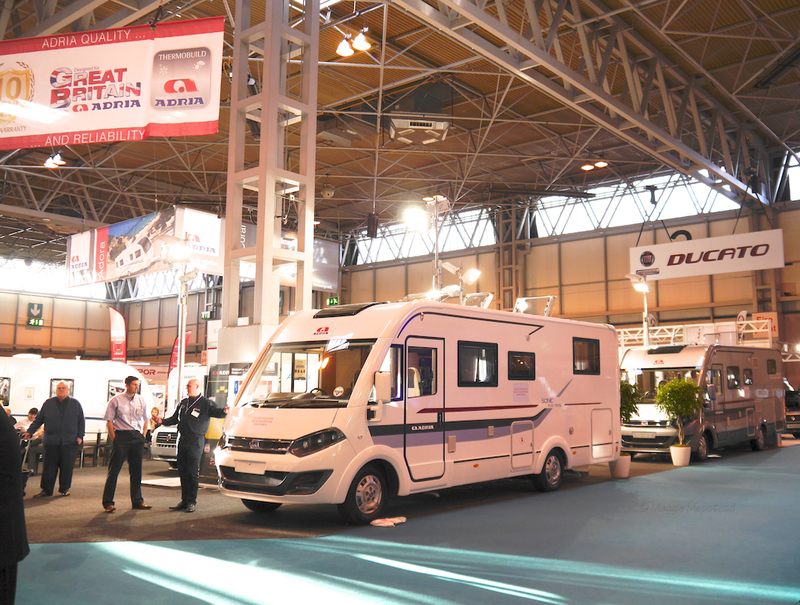 Lingered at the Adria and Ducato stands. 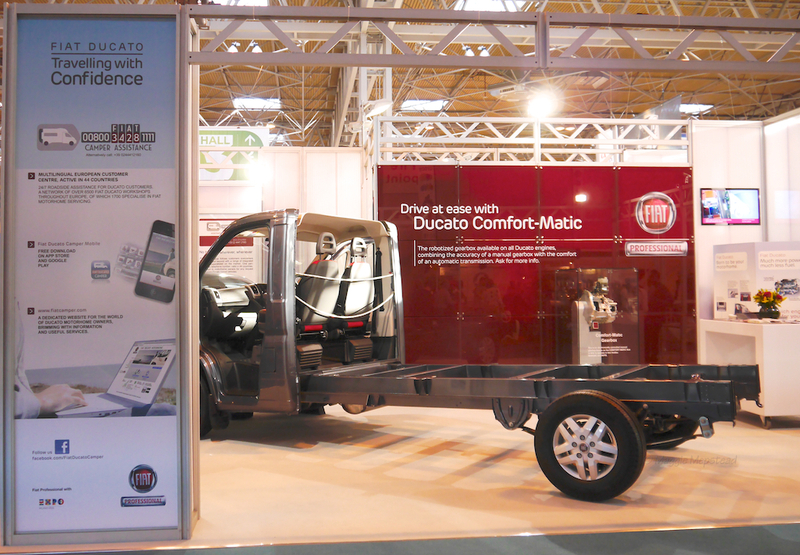 Excellent to see the Ducato chassis and to know that mine is already at the Adria factory in Slovenia being built on. Hope I don’t ever see my chassis like this. Also delighted to find out that I automatically get 2 years of Ducato camper assist free, wherever I am in Europe (well I’m always in Europe but you know what I mean) – not that I really want to have to use it! Seven weeks til The Van arrives …..
Next > All in the name …. Love hearing about your evolvement into the “gadding about” world. Great pictures. We’ve been at the motor homing game for 12months now…absolute beginners…never even owned a caravan! We love it. 1. A 3G MIFI….for internet access wherever we can get a “3” phone signal. We buy the 3gig simcards off amazon, they last for ages. So we don’t rely on anyone else. Thats how I blog when on the road. 2. Caravan Club Membership. Purely for access to their huge number of Certified Locations (CL’s)…Which only allow up to five vans. It will pay for its self in the UK. 3. External thermal silver screens. The amount of heat lost through the windscreen when parked up is bonkers….Easy to fit on and off. The most popular is “Silverscreen” Also great in the hot weather from stopping the van from cooking up, when parked in the sun. I’ve got an internal windscreen blackout “thingie” or rather will have – do you think an external one is needed as well? Thanks, I’ll take all the tips I can get!